Rally Raid Products developed a partnership with Dutch Suspension specialists Tractive Suspension, first developing the range of KTM 690 Suspension upgrades, and later the Honda CB500X/F project was greatly enhanced by Tractive's suspension solutions for the bike. 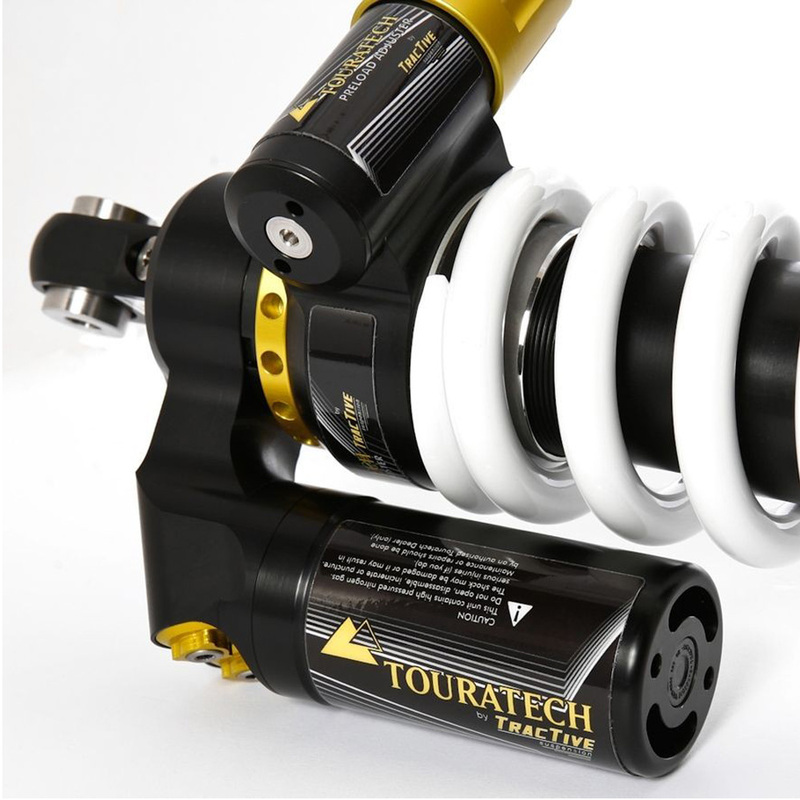 Tractive Suspension are the engineering and manufacturing team behind the popular Touratech Suspension range, which has led to Rally Raid Products offering the Touratech Suspension Range to their customers. Due to our experience with the KTM 690 and Honda suspension products, we have all the required knowhow, tools and spare parts to support this product range. We are very excited to be able to offer these fantastic products, please do not hesitate to email us should the suspension item you require is not listed, to start with we are showing Touratech's Best Sellers! Fully serviceable. Ensures long-lasting maximum ride dynamics. Adjustable rebound damping on shock absorber base with special touring setup. Available with different spring rates to compensate for heavier or lighter rider and luggage weight. Strong stainless steel bushings in eyelets ensure the securing bolt is seated firmly with no play even under maximum loads. Special low-friction seals with Teflon backup ring for low wear and long shock absorber life. Large 16 mm shaft made from induction hardened, Q&T chrome molybdenum steel for maximum stability and durability. Floating piston design. Damping oil and nitrogen filling are separated, achieving finer more stable absorber response. Special Touratech setup combining balance and damping, right out of the box. Uniquely solid Touratech hydraulic spring preload with 50%- 100% greater adjustment range for short weekend trips or long-distance riding with lots of luggage. Separate high and low speed damping settings. For precise damping adjustment at very high damping frequencies with heavy loads (bad roads, off-road with luggage). External reservoir on shock absorber improves damping fluid cooling for higher damping performance during heavy use and longer lifetime. Shock absorber length adjustable by 8 mm. Enables basic adjustment of bike‘s balance according to motorcycle model. Also adjustment for special conversions or an extreme setup. PDS – position-dependent damping system. Second damping piston provides hydraulic protection against bottoming out. Shock absorber will not bottom out. This is an exclusive feature not found in any other after market shocks.
. The Touratech suspension system that adapts itself to your adventure - so all you have to do is ride! 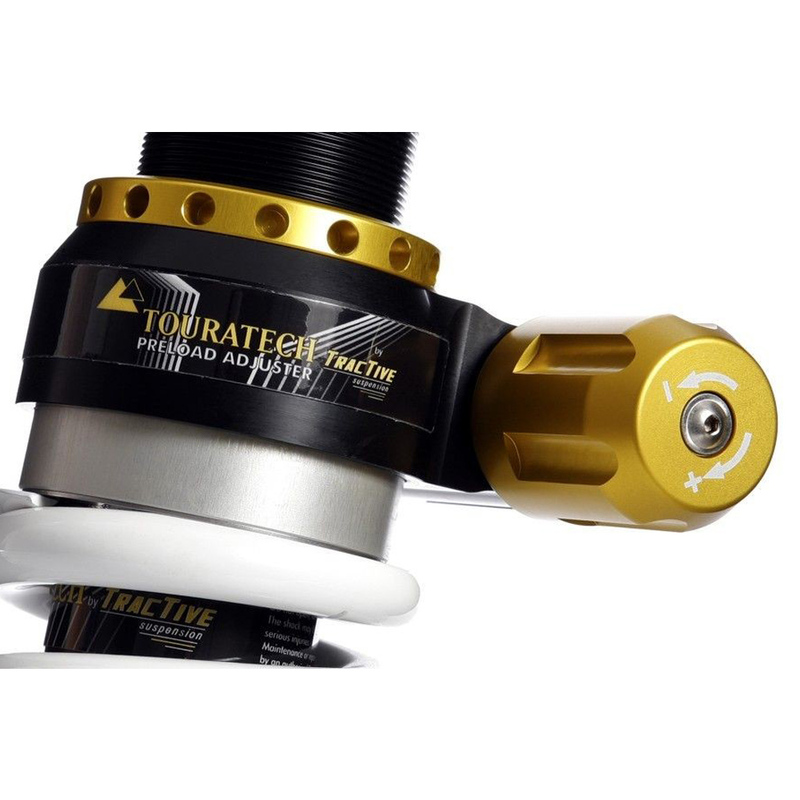 This Touratech Suspension DDA / Plug & Travel shock absorber is manufactured using the same precision components and parts that have been tried-and-tested in our shock absorbers over thousands of miles of touring, under the most intense conditions. At the heart of this shock absorber is the high-performance DDA valve, developed and patented by Tractive Suspension. It allows the damping to adjust in fractions of a second to any riding situation. To withstand the rigours of long-distance touring, our shock absorbers have a larger piston diameter, which means a larger oil capacity. This enables better cooling with a high damping frequency. As a result, the shock absorber and damping are more stable and there is less stress on the seals. For the rigours of long-distance touring, we use a larger piston diameter and the floating piston design allows the oil and nitrogen to work separately. This achieves optimal heat dissipation under heavy loads while giving the shock absorber* extremely fine response characteristics. Typical for Touratech - uses tried-and-tested precision components and parts. External reservoir provides extra compression damping adjustment. Separate high speed and low speed settings for extremely fine and effective adjustment of the semi-active Touratech DDA basic damping setup. Example application: Ideal adjustment for long off-road rides with heavy luggage. Ideal damping adjustment for journeys on country roads and/or a sporty riding style. Enables finer response from semi-active suspension system even with very high damping frequency (bad roads, off-road) while still maintaining high shock absorber life expectancy. All riding modes and settings options in the BMW R 1200 GS Adventure DDC system are fully retained. The Touratech DDA / Plug & Travel shock absorber is operated via the original BMW handlebar controls. The Touratech suspension system that adapts itself to your adventure - so all you have to do is ride! In the riding mode you select, the road conditions are actively monitored as you ride. Your bike's suspension adjusts to maintain perfect balance. The lean angle and acceleration sensors on your BMW R 1200 GS Adventure are also actively monitored. The suspension system adjusts the damping in fractions of a second via the patented DDA valve - virtually in real-time - and is always optimally matched to the prevailing riding conditions. This gives you the greatest possible comfort, finest level of feedback and fantastic ride dynamics. Touratech Suspension 01-044-5875-0 This shock absorber has been specially configur..
Touratech Suspension 01-041-5875-0 This shock absorber has been specially configured for the ..
01-040-5877-0 This shock absorber has been specially configured for the Telelever front wheel..
01-040-5882-0 The Level 2 shock absorber for the BMW R1150GS is the right choice fo..
01-041-5862-0 The Level 2 shock absorber for the BMW R1150GS ADV is the right choic..
Touratech Suspension 01-044-5872-0 The Touratech Suspension Extreme shock absorber ranks in t..
Touratech Suspension 01-044-5877-0 This shock absorber has been specially configur..
Touratech Suspension 01-048-5846-0 Putting it simply, the Touratech Suspension Cart..
Touratech Suspension 01-048-5866-0 Putting it simply, the Touratech Suspension Cart..
Touratech Suspension 01-048-5840-0 Putting it simply, the Touratech Suspension Cart..